The number of international students in Canada is steadily increasing. Till very recently, America was the most popular destination for higher education. It hosts over 1 million international students but, the number of new students applying for higher education in America is dropping. International student applications for the fall 2016 session saw a decrease of 3.3% as compared to the 2015 fall session admissions. While this may be a cause for worry in the USA, it is a cause for celebration for the country’s northern neighbor – Canada. Canada has been judged the number 1 country in the world for the best country to study in and the best country to live in. It comes as no surprise then to note that the number of international students enrolled in Canadian universities in 2013-14 was almost double of what it was a decade ago. International students in Canada are dominated by the Asian student population but in Quebec, most of the international students were from France. This goes to prove that education in Canada is popular not only with people from one part of the world but with students everywhere. 9% of these students were enrolled in undergraduate degree courses while 17% were enrolled in Master’s degree courses. 29% of doctoral students in Canada were from abroad. Canada may not yet be home to the most number of international students but is getting there quite fast. There are many reasons for Canada’s growing popularity as a student destination. Canada has a number of world-renowned universities. These universities are known for their high academic standards and stress of research-oriented study. In 2012, the University of British Columbia, University of Toronto, McGill University and McMaster University were placed in the top 100 universities across the world. Research is a key aspect of higher education in Canada. This is sponsored by the Canadian government and private sector companies. Some of the research fields popular in Canada are agriculture, medicine, telecommunication, computer technology, medicine and environmental science. It isn’t just Canadian colleges and universities that are making an effort to look more appealing to international students; the government is doing its bit as well. 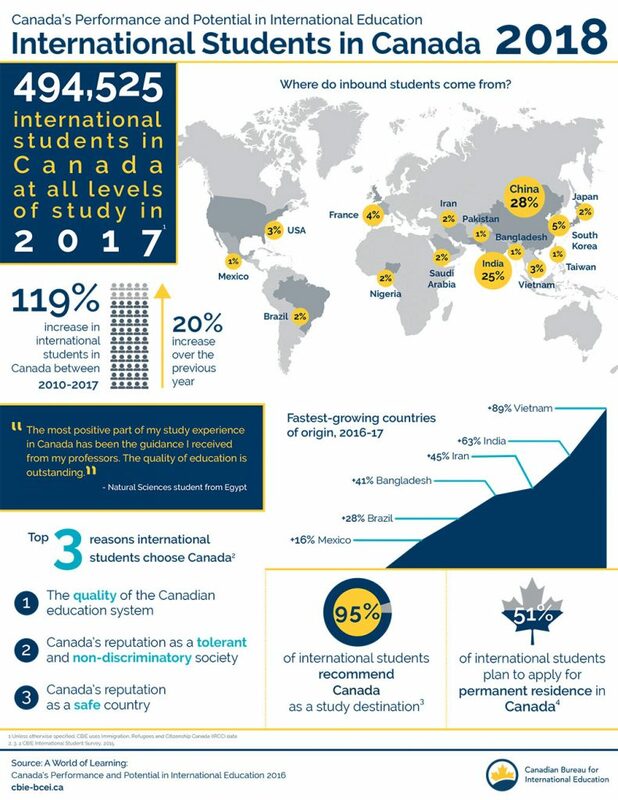 Recently Canada’s International Education Strategy announced that it wants to increase the number of international students enrolled in Canada to 450000 by 2022. In 2008, this number stood at 128411 while in 2016, it increased to 267780. There are a number of steps being taken to meet this goal. It involves not only making Canada seem more attractive to international students but also retaining them after their course as permanent residents by offering more work opportunities. While on one hand, America is making it harder for immigrants to get a visa, Canada is making the student visa process easier. Canada recently evaluated its student visa system to make it more accountable. Full-time students may now also be granted a work permit that allows them to take up a part-time job for up to 20 hours a week. On completing their course of study, students are permitted to live and work in Canada for up to 2 years. After completing one year, students can apply for permanent residency status. With a work permit, even full-time students can look for work on and off campus. This makes the prospect of studying in Canada even more appealing as working while studying helps reduce student debt. Jobs in Canada available to international students include positions in hostels, hotels, tutoring, general labor etc. After graduation, international students can easily find a full-time job in Canada. Most international students get placed in top Canadian companies after graduation. A job in hand, in turn, makes it easy for the individual to apply for permanent residency in Canada. As compared to America, the cost of studying in Canada is much more affordable. For a 4 years course, international students have to pay tuition of approximately $24,930 in the USA. On the other hand, in Canada, this would cost on $17,264. In addition to this, it is a lot easier for international students in Canada to get financial aid as compared to America. Some of the most popular scholarships and grants available for international students include the Vanier Canada Graduate Scholarships, the Concordia University Undergraduate Scholarships and the Canadian Commonwealth Scholarship Programme. Along with the reduced tuition fee, living costs in Canada are also much lower than in other parts of the world. One of the reasons for the growing number of international students applying to Canada is the change in the political scene in America. President Trump’s ‘Put America First’ rhetoric seems to be discouraging students from applying for college education in America. The added hurdles to getting an H1B visa and permanent resident status have added to the student’s reasons for staying away from America. After all, it does make more sense to study in a country that will allow you to work there later as well instead of studying in a country and having to look for a job elsewhere. International students in Canada feel not only welcomed but does its best to make them feel comfortable. The 1971 Multiculturalism Policy of Canada made it the first country in the world to declare a policy of multiculturalism. This protects the rights of all Canadian citizens regardless of their ethnic origin, language, race or religion. In addition to protecting their cultures and values, Canada also preserves the respect and dignity of all immigrants. While over a billion Canadians speak English, French is spoken by over 250 million Canadians. Canadians are also known to be the most welcoming and hospitable people. The Canadian government takes an active role in keeping international students safe and well cared for. A number of measures are taken to keep students safe in schools with respect to human rights while ensuring that they enjoy all kinds of freedom. The low cost of medical insurance also makes it affordable for all international students.